“I want to tell you about my weekend,” Cook said to open his presser. “We won the Ameritas Classic, Clarence Thomas sat in my box — that’s a Supreme Court justice for you young people that don’t know politics and government. He watched the match; he’s a big fan of ours. He was there and I got to hang out with him for a while. Dwyane Wade and Gabrielle [Union] rolled into the office, they hung out for a while." Like many other Husker fans, Cook made his way to Memorial Stadium and hoped Nebraska would get a football game in, but even a cancelation couldn't totally diminish an otherwise "great weekend." Nebraska swept Ohio and Wake Forest and beat Santa Clara in four sets to improve to 4-1 on the season and take home the title at the Devaney Center. Now, Cook’s attention shifts to the next challenge — a Thursday night showdown in Omaha against in-state foe Creighton and a Sunday night match against Iowa State. Cook said there’s “no question” in his mind that Creighton is a bigger challenge than Florida was in the season-opener. The Gators beat the Huskers in four sets. The latest AVCA Coaches Poll saw Wisconsin and BYU (Nos. 8 and 9 last week) leapfrog the Huskers, bumping Nebraska down to No. 7 this week. Florida is sitting at No. 8 after dropping a four-set match to USC, who dropped from No. 7 to No. 10 but also received one first-place vote. Minnesota jumped from No. 3 to No. 1 with Wisconsin slotting in right behind at No. 2. Penn State at No. 5, Illinois at No. 11, Purdue at No. 19 and Michigan at No. 20 round out the Big Ten teams in the poll. Creighton moved up one spot to No. 14 while Iowa State is first among teams receiving votes. The Bluejays are 4-2 after capturing the SMU DoubleTree Classic title in Dallas, Texas, over the weekend. Creighton beat Kentucky in five sets and lost to USC in five last weekend, both top-20 opponents. 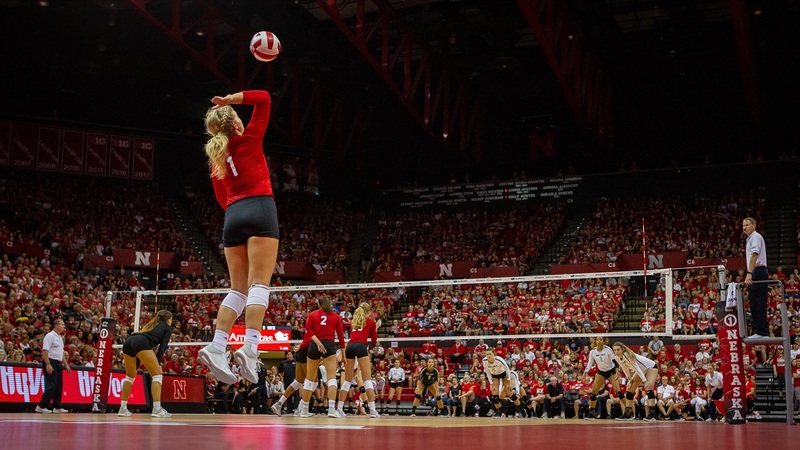 For the first time this season, Nebraska will be leaving the friendly confines of the Devaney Center for a match, something Cook said will be an important experience for his young team. In 2015, the last time these two teams played at what is now called CHI Health Center Omaha and was previously CenturyLink Center Omaha, 10,131 fans filled the stands to watch the Huskers sweep the Jays. There will likely be plenty of red in the arena on Thursday, but Cook plans to treat it like a true road match. Nebraska beat Creighton in four sets in Lincoln in 2016, but the teams did not face each other last season. Going forward, Cook said the programs intend to continue the series. Creighton will come to Lincoln next season, but scheduling uncertainty prevents locking in the match on an annual basis long-term. First serve on Thursday is set for 7 p.m. and the match will be televised on NET. Sunday’s match against Iowa State is set for 1 p.m. and will be shown nationally on ESPNU.